As regular readers of the Rhodes List are aware, my two sons & I are planning a cruise to Isle Royale National Park in Western Lake Superior next summer. We are planning to sail our Rhodes 22 from Grand Portage, MN across 22 N.M. of Lake Superior to Windigo Ranger Station in Washington Harbor, Isle Royale. From Windigo, we will circumnavigate Isle Royale in a clockwise direction, ending up back at Windigo about a week later give or take a few days, depending upon Lake Superior�s moods. We will be using 3 Old Town Loon 138 kayaks to help explore the island�s rugged, rocky coastline. Previous articles have described how we plan to tow the kayaks behind the mother ship (Rigging Sea Kayaks For Towing, 8/23/01) & how we will transport the kayaks while trailering our Rhodes 22 over the road (Carrying Kayaks On Vehicles or What I Did On Labor Day, 2001, 9/8/01). Our float plan intrinsically implies the ability to get into & out of the kayaks from the mother ship numerous times. Lake Superior water is very cold, even during the summer when we�ll be there. We don�t want to have to 1st get into the water every time we want to use the kayaks. Because of the difference in deck heights between the Rhodes 22 & the kayaks, getting into or out of the kayaks involves momentarily standing up in the kayak. Now, kayaks are very stable craft when you�re sitting down in them. But, have you ever tried standing up in one, especially a kayak loaded with beach camping gear & the only food available for 20 miles in any direction? Just for good measure, imagine there�s also a 2-4 Foot Lake Superior chop. When you�re sitting down in the kayak, you can attach the spray skirt to the rim of the cockpit. With the spray skirt in place, a capsize is no big deal, the water stays outside, the precious gear stays inside, & you Eskimo Roll yourself back upright. But, when you�re standing up, the spray skirt can�t be attached & you�re vulnerable to whatever Lake Superior dishes out, just at the moment when your elevated center of gravity makes you the least stable. This problem can�t be entirely eliminated, but it can be minimized to the point where we feel the risks & consequences are acceptable. Pictures of how we mitigated this,potentially show-stopping, issue. 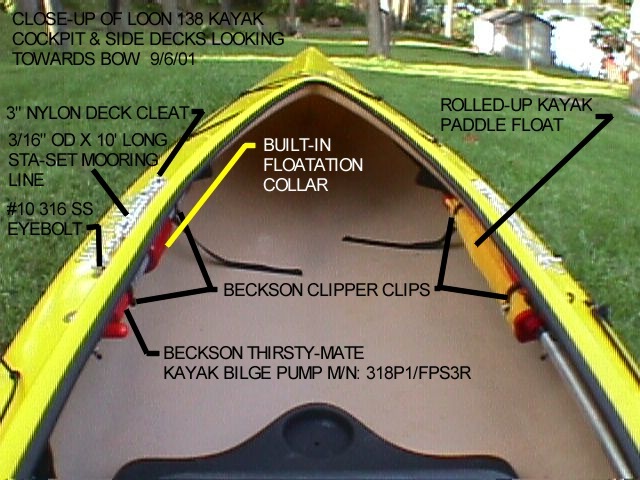 The 1st picture is a close-up of the cockpit & side decks on one of the kayaks. Note the eyebolt & deck cleat with the coiled-up line on the port & starboard side decks. The attachment points of these eyebolts & deck cleats are equally spaced fore & aft of the Center of Resistance (CR) on the kayak�s hull when it is evenly loaded & floating on its designed waterline. The coiled-up line would be led from the eyebolt, up around the stanchions on each side of the side gates on Dynamic Equilibrium�s railings, & back down to the deck cleat. When you stand up or sit down in the kayak, put a little more weight on the side closest to the mother ship. This offset weight causes the kayak hull to heel slightly until the slack in the line is taken up & the kayak is supported. As long as you keep your weight slightly off center towards the mother ship, the relative rolling motion is very small. Having the line�s attachment point centered on the kayak hull�s CR means that wind, waves, & chop cause a minimum amount of relative yawing (side-to-side motion in the bow & stern). Having the mother ship & kayak tied together in this manner causes them to rise & fall together in any sort of reasonable swell, thus minimizing the relative pitching (up & down motion in the bow & stern). The 2nd picture shows my 15-year-old son, Gary, practicing this boarding maneuver off our dock on Sanford Lake. Gary waits for a powerboat to go by & then uses the boat wake for practice. Our dock height is about the same as the deck height on our Rhodes 22. By moving around to each side as well as the end of the dock & using both port & starboard sides of the kayak, boarding practice with waves coming from various directions can be simulated. Note that practicing off our stationary dock is actually somewhat more difficult than off the deck of our Rhodes 22 because the relative motion is greater with the fixed dock. Although it�s MUCH easier than before, this boarding maneuver is by no means bulletproof even with the new system. You don�t want to stand up in the kayak any longer than you absolutely have to. Proper wave timing & a certain amount of balance & coordination are still essential. Standing up is more difficult than sitting down. But, at least it�s possible now as opposed to VERY difficult before & it gets easier with practice. These built-in dock lines & deck cleats will also be useful for tying up the kayaks anywhere. Even with the new system, it is still possible there will be a kayak capsize during boarding at sometime during our cruise. Isle Royale is the most remote; least visited National Park in the lower 48 states. There will very likely be no help available nearby; so, we must be prepared for self-rescue. In the 1st picture, there is a hand bilge pump under the gunnel on the port side of the cockpit. All 3 kayak cockpits are set-up the same � P is for pump & port side. The bilge pump is a Beckson Thirsty-Mate kayak bilge pump, Model No: 318P1/FPS3R. Note the built-in orange floatation collar on the pump in case it is dropped overboard. Under the starboard side gunnel is a kayak paddle floatation bag. These safety devices are mounted in Beckson Clipper Clips. They are held in place very securely & don�t interfere with the paddler, but also simply snap in & out when needed. The Beckson Clipper Clips are also functioning as the backing plates for the 10-24UNC oval head stainless steel thru bolts on the side deck eyebolts & deck cleats. It turns out that the mounting hole spacing on a Beckson Clipper Clip & a Schaffer Model No: N3200080, 3 inch nylon deck cleat are nearly the same, close enough to use them together with minor machining. To eliminate protruding threads & nuts inside the hull & out, the Schaffer deck cleats are mounted with, 10-24UNC X �", Beckson barrel nuts instead of conventional nuts. The paddler�s legs are right in the vicinity of the deck cleat mounting & I wanted to eliminate the possibility of chafing or cuts on exposed hardware. In the event of a kayak capsize, the bilge pump would be employed by the person in the water to get as much water as possible out of the hull. 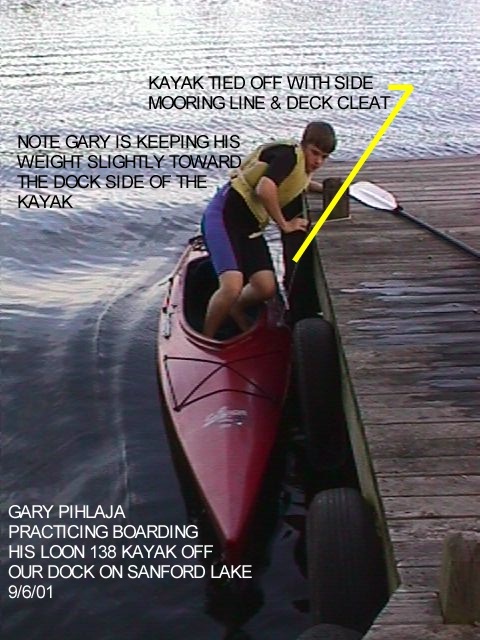 Kayaks have some built-in floatation, but not enough to support the hull, gear, & paddler when the hull is full of water. Once the hull is pumped out, the kayak paddle floatation bag is manually inflated & secured to the blade on one end of the kayak paddle. Kayak paddles float & each kayak will be equipped with a spare paddle in case a paddle is lost during the capsize. The blade on the other end of the kayak paddle is secured under the bungee cords on the kayak�s foredeck just in front of the cockpit. The kayak paddle with the floatation bag will now function as an outrigger allowing the paddler to climb back into the cockpit without flipping the kayak again. Once back inside, the paddler uses the bilge pump to remove any remaining water. The 3rd picture shows Gary practicing this self-rescue maneuver in deep water just off our beach in Sanford Lake. No one kayak will carry all the food, gear, & other consumable supplies such as water, stove fuel, etc. We will load only the supplies & gear necessary for that particular beach camp into the kayaks, usually an overnighter + a contingency day�s supplies in case we can�t get back to the mother ship due to weather or some other reason. The rest will be left on board Dynamic Equilibrium. We will carry 3 days extra supplies on board Dynamic Equilibrium. Gear & supplies will be loaded into water tight "Baja Bags" & secured inside the kayaks. 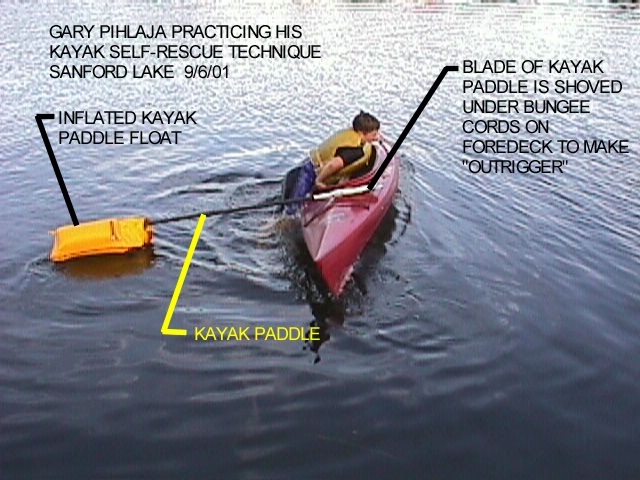 I will be adding some internal padeyes to all 3 kayaks to facilitate this. We will always be wearing shorty wet suits & PFD�s when we use the kayaks in order to provide floatation & some protection against hypothermia if we end up in the water. Based upon on our degree of boarding/kayak handling competence at the time of the trip next summer, we will establish go/no go weather criteria for use of the kayaks & the Rhodes 22. There may be some days when we have to stay on board Dynamic Equilibrium or in camp ashore waiting out the weather. This boarding stability issue is a major reason why inflatables are preferred as yacht tenders. We have a 10 foot inflatable sport dingy. It�s rated to carry over 1000 lbs and nearly all the floatation is around the perimeter. I weigh 230+ lbs & I can stand on the side tubes, walk around inside the boat, or climb in from the water anywhere around the boat without flipping it. Inflatables are so stable that boarding stability is simply not an issue. Those of you using small hard dinghies, folding boats, or canoes for your tender may want to consider adding some side mooring lines similar to the ones discussed in this article. If it works for something as squirrelly as a kayak, it can only work better on anything more beamy & stable.